Carnelian and Sterling Silver Cuff Bracelet from Indonesia, "DNA in Scarlet"
A helix of sterling silver flanks a stone of orange-red carnelian, featuring a minimalist and elegant design reminiscent of DNA strands. This cuff bracelet is crafted by Balinese artisan Komang Suastra, who has been involved in jewelry from a young age. 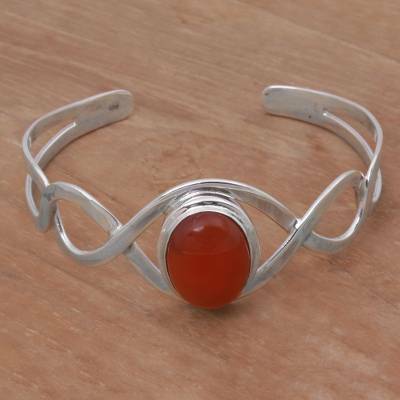 You can find carnelian cuff bracelet 'DNA in Scarlet' by Komang Suastra in jewelry categories such as Birthstone Bracelets, Carnelian Bracelets, Silver Bracelets, Sterling Silver Bracelets and Cuff Bracelets. Enjoy exploring these sections for other Novica treasures. "This is my favorite bracelet to wear"
I love the way the intricate curves of the sterling silver embrace the stone.